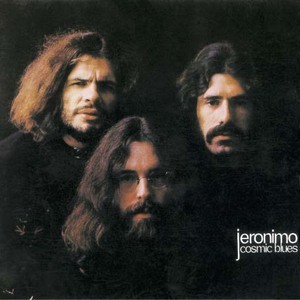 Three artists: 1: Jeronimo, a band founded in 1969. 2: Jeronimo, singer-songwriter from The Netherlands. 3: Jeronmio, a trip-hop/hip-hop artist from Mexico. 4: Jeronimo, a hip-hop artist from Kutaisi, Georgia. 1: Jeronimo was founded in 1969 and in '69/'70 they had their first two hits "He Ya" and "Na Na Hey Hey". With these two chartbreakers, Jeronimo climbed to the number 1 position in almost all European countries. 1: Jeronimo, a band founded in 1969. 2: Jeronimo, singer-songwriter from The Netherlands. 3: Jeronmio, a trip-hop/hip-hop artist from Mexico. 4: Jeronimo, a hip-hop artist from Kutaisi, Georgia. 1: Jeronimo was founded in 1969 and in '69/'70 they had their first two hits "He Ya" and "Na Na Hey Hey". With these two chartbreakers, Jeronimo climbed to the number 1 position in almost all European countries. In 1970 Jeronimo and Steppenwolf toured successfully through Germany and in the same year Jeronimo partook in the legendary "Progressive Pop Festival" in Cologne. Following that, Jeronimo shared the headlines with such groups as Deep Purple and Golden Earring at various European open-air festivals. In 1971, Jeronimo's biggest stage-performance was in Lausanne for "UNICEF" and was televised worldwide. Jeronimo could be seen in numerous European television shows and in Germany they were on "Hits A Gogo", "Beatclub" and "Bananas". In the spring of 2002, 4 new CD's "Jeronimo", "Cosmic Blues", "Time Ride" and "Best Of" was released, which have been digitally mastered from the original recordings. There will be a bonus track on each of the CD's (partially with previously unreleased material). 2: "I live for music," says Jeronimo. And it's a good thing he does, too, because it's one of the few constants in the fast-rising star's chaotic day-to-day. Born in Brazil, the singer-songwriter, was adopted as an infant by a Dutch family. But when he was only 10, his parents divorced, and he relocated to exotic Sri Lanka with his mum and sister. There, he learned English -- fast! -- while listening to a neverending soundtracks of Josh Groban and other artists. Within two years, the standout student was back in Holland and being invited to choose for himself where to enroll next. "Basically," he recalls, "I picked 'High School Musical.'" In other words, he attended the sort of academy that offsets its math and science classes with acting and dance instruction. A few short years later, Jeronimo's drama coach informed him that the famous Dutch writer Carry Slee was holding auditions for her second film, "Timboektoe." Drawn to the rush of the tryout more than the prospect of being cast, he went -- and booked his first movie role! "Hopefully," he adds, "it won't be my last, either!" jeronimo's bio2Today, as he prepares for the release of his debut album -- a modern-pop mash-up of inspirations from his idols -- Jeronimo more than ever adheres to his "I live for music" motto. But, in spite of his laser-like focus on his career, he remains endearingly goofy, a regular kid who cops to being enamored of Selena Gomez, scared witless of bugs and ambivalent about T-shirts. "I'm not a nudist," he insists. "I just don't like clothes that much!" In short, Jeronimo has the voice, the talent, the look and the drive to become an international sensation, a Justin Timberlake for a new generation. And, as long as at the end of each day, he can chill with his friends and listen to music on his iPod, he won't just be happy, he'll be ecstatic. After all, as he'd be the first to tell you, when you live for music, you live a pretty sweet life. 3: Born in Mexico City in 1974. Jeronimo is a bass player, Composer and singer-rapper, founder member of the band Poncho Kingz . Signed in 1997 with BMG-RCA M?xico , they recorded their first album in New York City , which includes the hit single Zero Varo. The band did several massive concerts like the first Vive Latino Festival in 1998. In 1999 the recorded the track Me Basta , for the tribute to the Mexican Singer Jos? Jos?, as well as the Millenium Partys tour on the South East Asia . After leaving the band in 2001 to continue his university career, and start working with the TV company Televisa Deportes as a producer , along with this he placed more than 25 songs on different TV shows with Editora San Angel. He graduated from the Recording Arts program of the Musicians Institute in Hollywood California . In 2005 returns to Mexico to work with New Art Sound , Planet Audio and Xtudio in diferent musical and cinema proyects , like American Visa , Morenita , 2033 and the TV series XY. In 2007 he released his first solo album Disponible en CD.